Hot threads from the year 20XX! 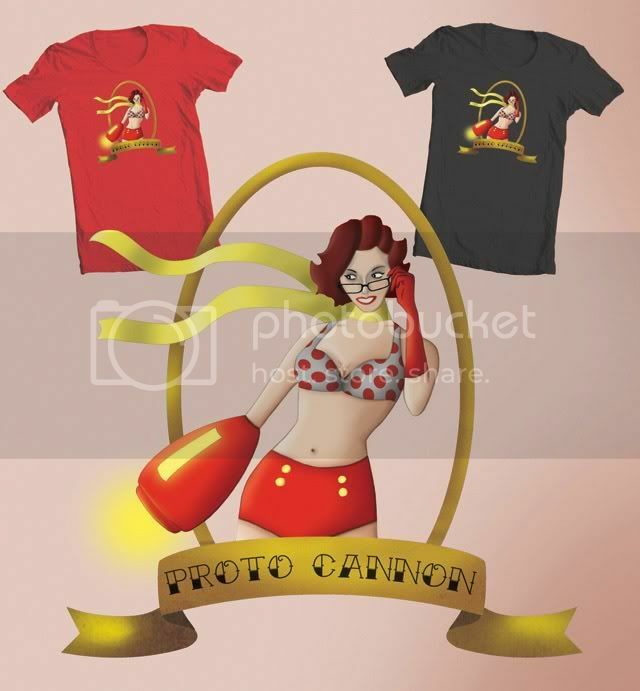 The other day, Nicole told me that Threadless.com was having a pin-up themed contest. 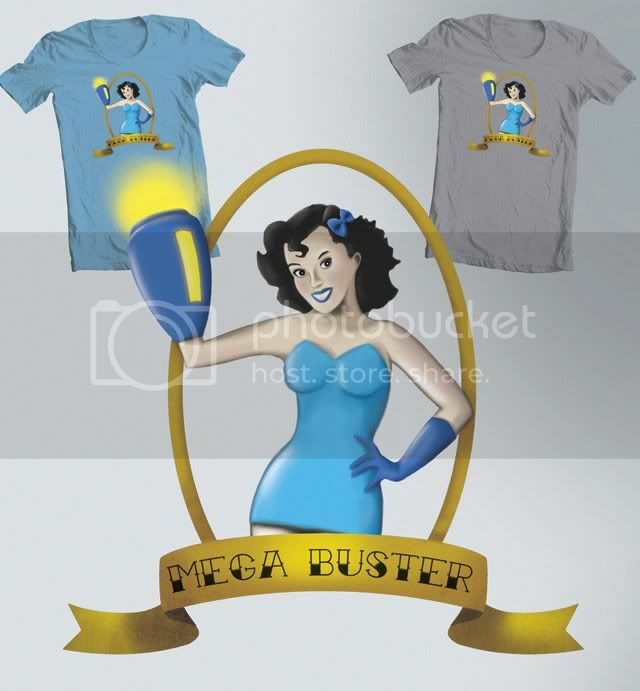 So I reworked my Mega Girl and Proto Girl Pin-up prints and submitted them. So now I need your votes like a crack baby needs crack a loving foster family and a stellar rehabilitation program. These votes are score-based, so make sure you give me a 5, leave a comment, and if you could pass this on to your friends and get them to do the same, you'd be super-awesome in my book. Vote for Mega Girl here. Vote for Proto Girl here. Be sure to vote for both, spread the word, and keep being awesome. This was incredibly fun to do, content-wise and practice-wise. I still consider myself fairly new to this particular style of illustration, and making myself go through nine paintings, one after the other like this, really taught me a lot. I'm still not where I'd like to be in terms of skill - and I suspect I'll never be - but I feel this set was a huge step in the right direction. The idea to do this set came to me at ........ some convention. Can't recall which one. Anyway, I'm sitting at the Simon table for something like five million hours a day, and you see a lot of cosplayers. Some good. Some bad. If you've been to a convention, you know what I'm talking about. 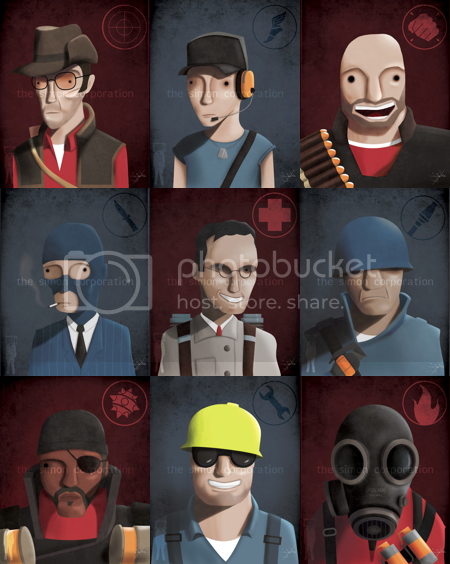 But every now and then, I'd see a person (or a group of people) dressed up like the Team Fortress 2 classes, and regardless of how good or bad the costume was, it just made me really happy 'cause I'm obviously a huge TF2 nerd. 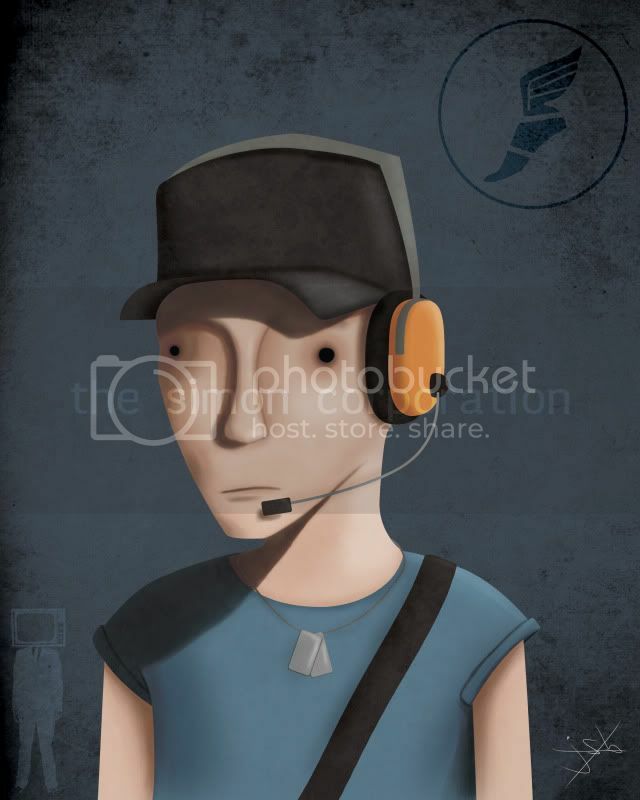 So I'd see an Engineer or a Scout walk by and I'd get all giddy and I'd always try to call them over to my table and give them props, but I wanted to do something more. That's where these paintings come in. 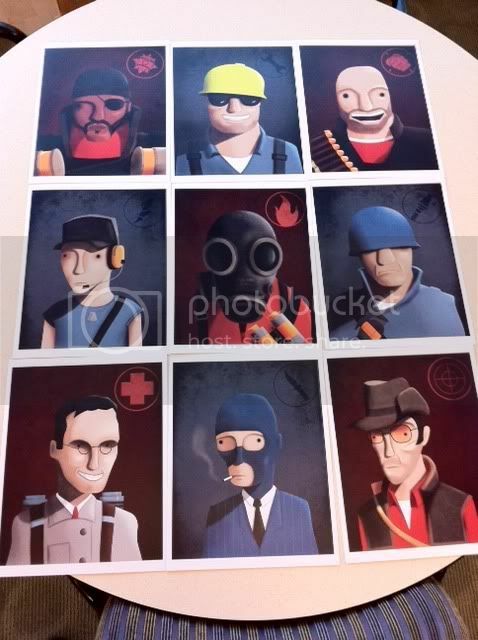 Along with the 8"x10" prints I plan to sell at my table, I also want to make smaller, baseball card-sized prints of each class and hand them out for free to any TF2 cosplayers I see. So if a Pyro stops by, I'm gonna stop them, wave them over to my table, and POW! 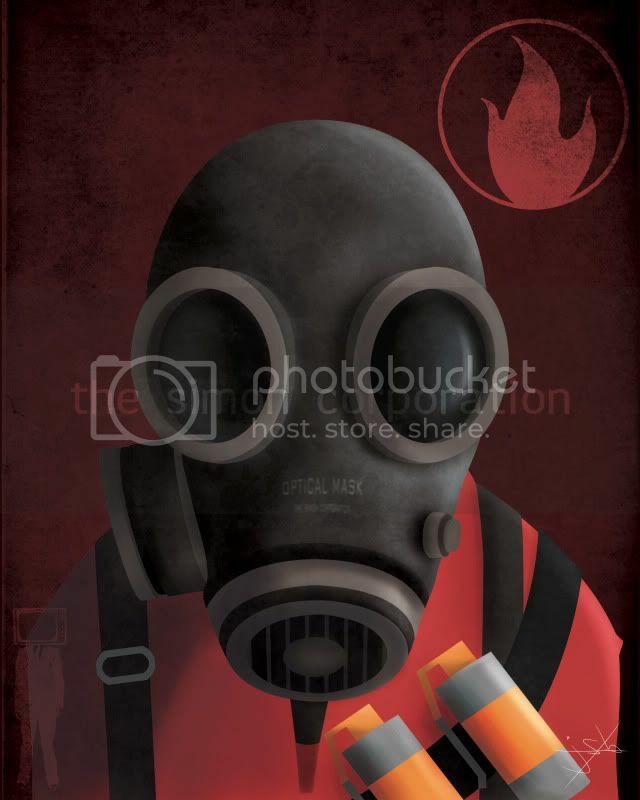 here's a free Pyro card 'cause you're awesome. On a completely unrelated note, I have an uncontrollable mutant power that creates small explosions when I hand cards to people, hence the POW! I should have them up in the gallery shortly. I'm still deciding when I should add them to the store. Naturally, I'm thinking about doing Left 4 Dead prints next. Sometime in the distant future. I've already done a bit of research, but I'm still not sure how I would want to do them. 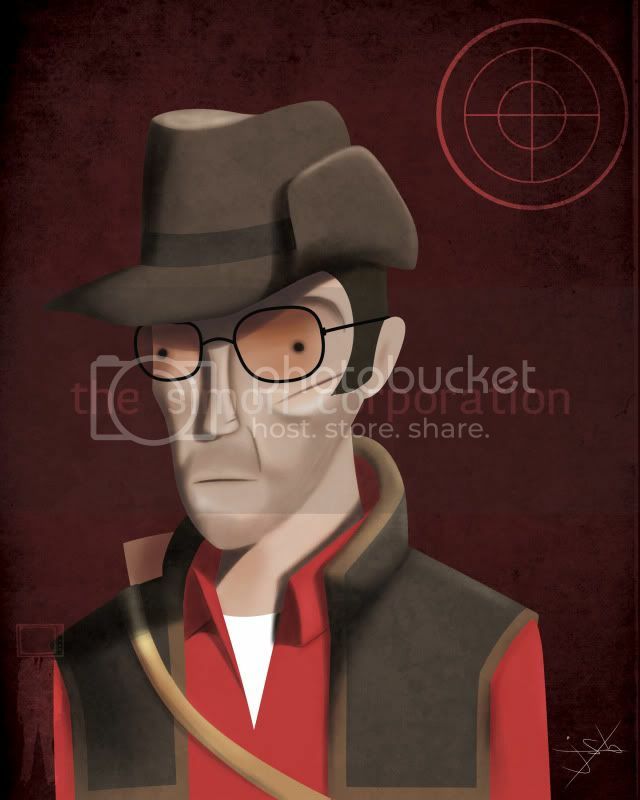 I could do the same goofy look I did for the TF2 prints, or I could do something more dark and serious. Come to think of it, Goofy and Stupid or Dark and Serious seem to be the only two flavors my stuff comes in. The one infected, twisted animator. The set is complete. I'm going to post a bit more in depth about this series later on. All that's left is the Pyro. Two more to go. Sniper's next.